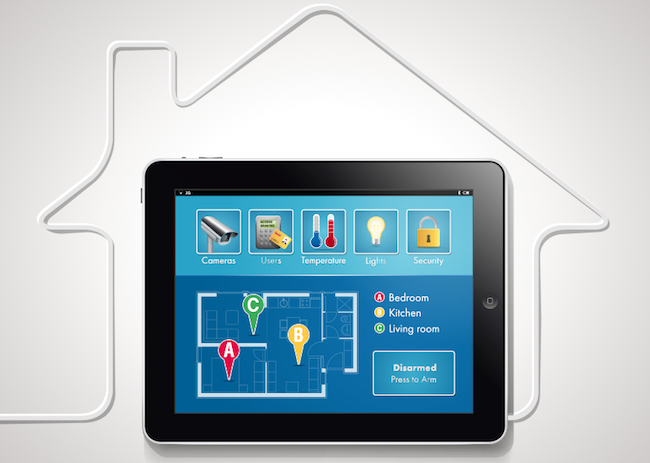 Are you ready for structured wiring to bring your home into the digital age? Place video cameras at your front door, in the back yard, or in a baby’s room and watch the pictures on any TV. Send files between all computers in the house. Share devices such as computer printers and fax machines. Easily make adjustments to all of these options as your family’s needs change. As a starting point, it is useful to think of a structured wiring system in terms of a house’s electrical system. Electricity flows into the house through a main power cable. This cable connects to a circuit breaker box, where it is separated and sent down smaller electric lines. These lines wind their way through your walls, ultimately ending at power outlets throughout your home. You then plug devices into the outlets and use them. In a structured wiring system, all external data lines (such as cable television, telephone, or internet) come into the house and are connected directly to a central control box. This box is usually the size of a large electric circuit breaker panel, and is placed in a similar location, such as in the basement or a utility closet. Within the control box, each incoming signal is split and sent down wires to multiple rooms in the house. In a good-quality central control box, the splitter will also contain a signal amplifier. This device makes sure each outgoing signal is as strong as the single incoming signal. Without an amplifier, the power of the incoming signal gets split among each outgoing wire, often resulting in significant performance loss. In layman’s terms, this means a snowy TV or staticy phone line. From the control box, bundles of wires run through the walls of the house to different rooms. With a good structured wiring package, these wires will be installed in a “home run” or “star topology” configuration. This means that each set of wires runs to only one outlet. This is in contrast to “daisy chaining”, which means one line goes first to your kitchen, then to your living room, then to your bedroom. Although daisy chaining is less expensive, it introduces problems as the signal quality in your bedroom (the last stop) is much poorer than that in your kitchen (the first stop). The wires included in the bundle vary by manufacturer, but you should look for at least two coaxial cables of RG-6 quality and two twisted pair cables of CAT-5 quality. “Coaxial cable” is just a fancy name for the typical black cable you use for purposes such as connecting your VCR to your television — the type with the copper wire sticking out the end and the annoying screw attachment. RG-6 is a rating of quality; some manufacturers use RG-59 or lower grades, but you should avoid these as your picture quality will not be as good. “Twisted pair” is another fancy name, referring to the telephone cable that runs to the phone jack on your wall. It is called twisted pair because it consists of two wires that are twisted around each other. (As strange as it may seem, the twisting actually improves the quality of the signal!) CAT-5 is a an abbreviation for Category Five, another indicator of quality. Generally higher numbers indicate better quality, though CAT-5e is one step better than CAT-5. These cables are often bundled together and covered with a plastic coating. This is advantageous as a bundle is easier to install, and the stronger wires (RG-6) help to protect the weaker wires (CAT-5) during the installation process. (With good-quality wires, there will be no loss of performance or interference from bundling.) This bundle is run through the walls of your house, and terminated at a wall plate. These plates are about the same size as a normal wall face plate. Depending on the wires included in the bundle, it will have two to eight different outlets. For example, with the four-wire bundle described above, the wall plate would have two cable jacks and two phone jacks. So far, the structured wiring system described does not offer much beyond a house’s standard wiring. This is where the second cable and phone lines become important. The first cable line carries a signal from the control box to the wall plate —for example, a satellite TV signal. The second cable line can then be used to carry a signal back to the control box — for example, the output from your DVD player. With the appropriate module inserted in the control box, this DVD signal could then be amplified and sent back over all outgoing cable lines on an unused channel number. You could then watch the DVD on any TV in your house simply by tuning to the previously unused channel. Where this technology really shines is when setting up a home computer network. For example, you can use a single CAT-5 twisted pair line to both send and receive computer data. An advanced control box will be able to decipher the data, and send it to the correct location. Thus, data coming in over an ISP connection will be sent to the correct computer, allowing for multiple users to share a single broadband ISP connection with no interference. Similarly, data can be sent from one computer and correctly routed by the control box, whether it is an e-mail message to be sent to a friend overseas, a file to be printed on your color printer in the upstairs office, or simply an instant message to your spouse working downstairs. Do I Need to Buy Everything Now? No. Many structured wiring packages come in different “feature levels.” If you are on a budget, you can install a basic system that will provide simple cable TV and telephone distribution. At a later date, you can add control box modules to enable additional features such as computer networking. The key is to make sure you have the bundles of wires running to every important room in your house. Since these bundles run through your walls, they are difficult and expensive to add at a later date. Building a new house, or conducting major renovations, provides an ideal time to consider installing at least a basic structured wiring package. Installation costs are significantly reduced when your walls are open (i.e. before the drywall is attached to the wall studs). Even if you are not interested in computer networking or whole-home video, it is useful to think of how the housing market will evolve, and to consider that the future buyer of your house may desire such features. In many parts of the country, a basic structured wiring system can be purchased and installed in a new home construction for about $1 per square foot of living space. This system would consist of a control box capable of simple video and telephone distribution and four wire bundles running to wall plates in each bedroom, the living room, the garage, and kitchen. The total cost to purchase and install the same system in an existing home can cost up to twice as much, or $2 per square foot of living space. Of course, as these are rough estimates only, actual prices may vary dramatically due to factors such as local labor costs, house floor plans, and features selected. How Do You Find a Manufacturer and Installer? There are numerous manufacturers of structured wiring packages, including Home Director, OnQ, FutureSmart, Home Automation Inc, and Lucent among others. Local installers can often be located through the manufacturers.